In our employees, we are looking for more than just animal lovers – we want people who want to work with other people who share their commitment to giving back to their communities and all creatures great and small. Whether you are starting your career, or looking for interesting and rewarding experiences on your career journey, we have many exciting opportunities available. Working with and for animals, advocating for their health and well-being or supporting others who do, can be a very rewarding and satisfying career. If you are hard-working, highly skilled and passionate about making a difference, you will find yourself among like-minded people at the BC SPCA. We have a dedicated team of dynamic, action-oriented and results focused staff and volunteers who do this very important work in communities across British Columbia. We have 44 locations in almost every corner of the province, including our Provincial Office in Vancouver. We employ more than 572 people in a wide variety of positions from direct animal care and protection to revenue development to government relations to administration, with various full-time, part-time and casual opportunities available. The BC SPCA is the first Canadian humane society to become accredited by Imagine Canada, the national umbrella for charities and non-profits, reflecting our high level of excellence in board governance, financial accountability and transparency, fundraising, staff management, and volunteer involvement. 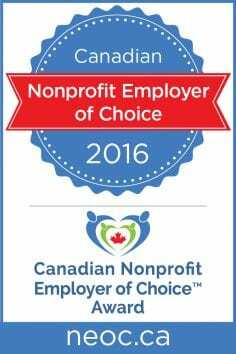 We were also named a Nonprofit Employer of Choice in 2016, demonstrating our commitment to making our organization a great place for people to work and grow. Review our current opportunities for positions that match your interests and qualifications. Submit your application as per the instructions on the posting. Put your best paw forward in the selection process.